The upper school received a visit today from the Langston Hughes Project, a fusion of music, literature and history led by Ron McCurdy, a professor of music at the University of Southern California’s Thornton School of Music. McCurdy first gave a morning lecture on Langston Hughes and the many artists of the Harlem Renaissance of the 1920s. 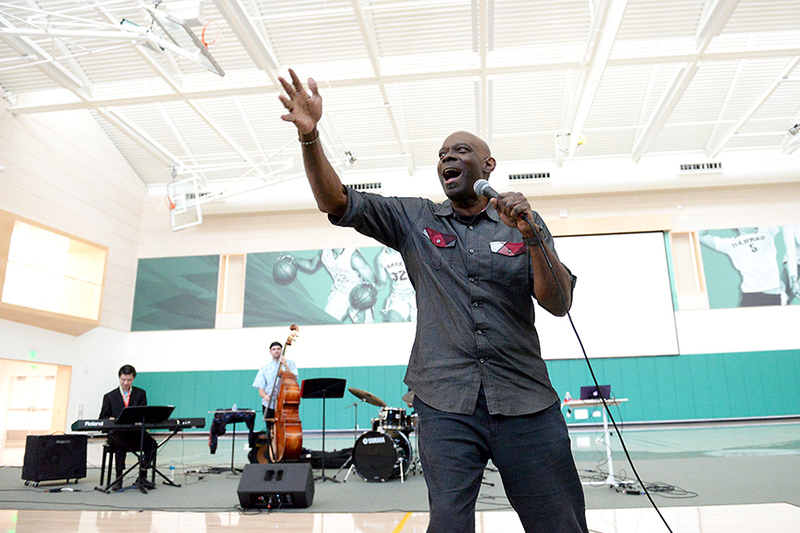 Later, the accomplished trumpeter was joined by drummer Mike Mitchell, bassist Giulio Cetto and pianist (and 2001 Harker middle school graduate) Yuma Sung at a special assembly at the Athletic Center, where McCurdy gave a powerful performance of Hughes’ poetic suite “Ask Your Mama,” reciting and singing Hughes’ lines as images and film reels of figures and events of African-American history were displayed behind the group.